When British Columbia joined Canadian confederation in 1871, Victoria became the westernmost point of entry to the new nation. 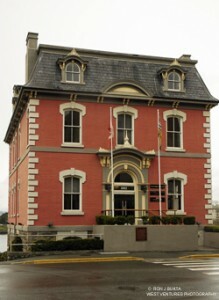 Built in 1876 as the first Dominion Customs House it was designed by Thomas Seaton Scott, a Department of Public Works architect. He used the Second Empire style, popular for government buildings across Canada. This building was intended to present the face of the Canadian Government to those who arrived by sea and to also provide tangible evidence to British Columbians of their new status. This is the last building that we see on the Harbeck video, perhaps fitting as the harbour is the reason that Victoria was chosen as the site of the Hudson’s Bay Company fort. The building has been extensively restored and is currently in good repair. No longer used for customs use, with customs facilities having been placed in later buildings, it is now home to lawyers and other professionals.